As I said the other day when posting Part 1, I was tired. I also don’t wish to delete older posts that may be of little value, rather I want to keep my workings and progress. Maybe a symbolic way of dealing with my “Shadow”. For those readers not into geekish financial maths, give this post a miss. Let us have another look at the results, this time with some tweaks to the approach and then we will go into some more depth trying to establish whether this method truly adds value to the Buy and Hold approach. According to the results from 1962 the Sharpe Ratio of the Ratio Cross vs Buy&Hold is better 0.50 vs 0.32. You can also see a superior Max DrawDown ratio, we do not focus on absolute return where buy and hold outperforms as our stated objective is to always focus on risk adjusted returns. I include the tail(sig_ratio) so that you can see that the system is invested at the moment. We now try a different study and look at the Sharpe Ratio on a yearly basis and then look at the mean of the 53 years. Here I get a confusing result which I don’t know how to explain, it seems to say that the Ratio Cross has a Sharpe Ratio of 0.60 vs 0.70 hmmm???. 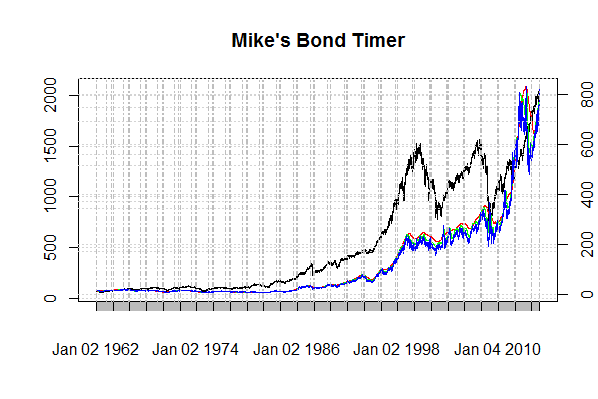 So to take this one step further I tested the market timing ability of my Bond Timer with the Treynor-Mazuy quadratic regression approach, and you can see below that the system produces alpha, which seems to suggest that the Bond Timer is providing market timing value add. Btw, the MarketTiming() function isn’t in the Performance Analytics package on CRAN so I have included the function in my code below. This is still very much a work in progress but I believe the ratio timing method adds value to a buy and hold approach, however I need to explain why I am getting a conflicting result when looking at Sharpe Ratio’s of 1 year at a time. # This is the magic signal or is it? It is the Nominal Price of the S&P500 / bond yield. # The fact that it is nominal worries me. # I like visual references ignore the red errors in the output console I am too lazy to fix up the axis. #our comparision, filtered result. The idea being to trade the short ratio while it is above the long ratio. # This looks at the Sharpe Ratio on an annual basis as opposed to the whole period. # In order to get rid of NaN's this function I found on StackFlow helps convert them to zero. 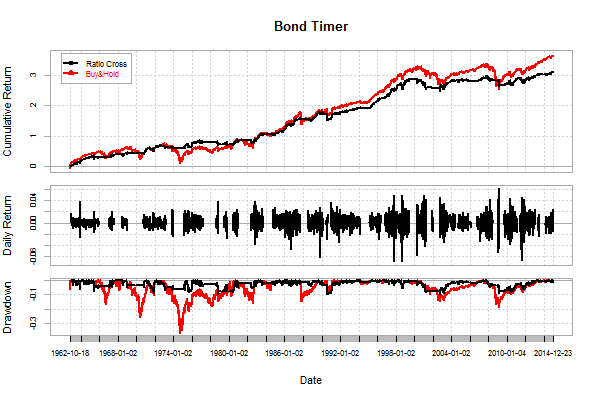 # Market Timing Function which is not part of the CRAN release. This entry was posted in Asset allocation, Investments, quants, R code, Statistics and tagged market timing, PerformanceAnalytics, quantmod, R, Treynor-Mazuy. Bookmark the permalink.